Here is your chance to take your pet out for a timed race for FREE! Choose the 5K and bring Fido along or consider running the 10K without Fido. Not up to running? Choose the one mile walk. All proceeds go to support the Humane Animal Welfare Society. So bring Fido out for a great run, great time and a great cause. There will be great food & beverages available, vendor booths and adoptable animals from HAWS. Simply register on line now, download the pledge form and collect pledges for your run / walk from friends, neighbors, relatives and colleagues. Raise $100 and we will refund your entry fee. Don't forget to ask your employer if they will match the funds. Caring for 6,000 homeless, lost and neglected animals a year. Specializing in adoptions services that match homeless pets with new families. Reuniting lost pets with their families. Providing classes, seminars and workshops to help new pet owners. Rescuing companion animals and wildlife. Providing life-saving spay/neuter and medical services at reduced cost. Rehabilitating dogs through the Mod Squad, making them great adoption candidates. They do all of this with no Federal, State or Local government funding! $100 helps feed an entire shelter ward! Imagine what $250, $500, $1,000 or more can do! Donate NOW! Want to run a fun 5K with Fido? Now is your chance. This out and back course starts at Genesee Lake Road Park and heads west along the tree covered Genesee Lake Road before the turn around at Golden Lake Road. There will be a water station for runners and for Fido. Don't have a Fido? Stop in at HAWS and adopt one! Pets are not required to participate. All pets must be on an 8' leash in the park and on the course. When running the 5K, please stay to the right with your pet as not to impede the other runners. The 10K course follows the 5K course, crosses Golden Lake Road before the turn back to the park. There are two water stops on the course. Sorry, Fido cannot run this event with you. Fido not up to running a 5K? There is a 1 mile walk option. Please ensure that your pet is on a leash at all times in the park. There will be athlete aid stations at approximately every 1.5 miles. The water station on the 5K will also have a pet aid station. The shirts are cotton and those registered by noon Friday September 28th are guaranteed a custom race shirt. After that, shirts be available while on line supplies last. 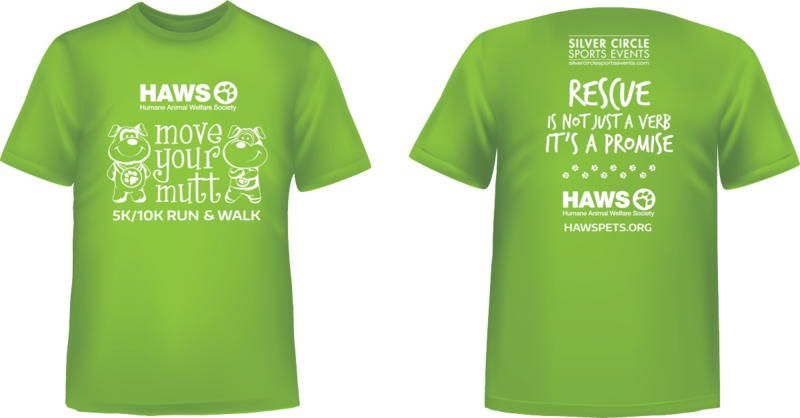 Any extra shirts will be distributed after the race on a first come first serve basis. From I-94: exit Highway 67 south. Turn right (west) on Genesee Lake Road. Cross Dousman Road and park will be on your left.